It’s also pretty important you call your friends to be sure you don’t all show up in the same outfit like the ladies in the photo below; how embarrassing! I love the way the above blazer mixes black and silver sequins, perfect for a night out. Ah, the above pictured Miu Miu sequin clutch, need I say more? And if you’re feeling like taking a risk: the sequin pant (pictured below). Now get out there and deck the halls with a little Holiday sparkle! 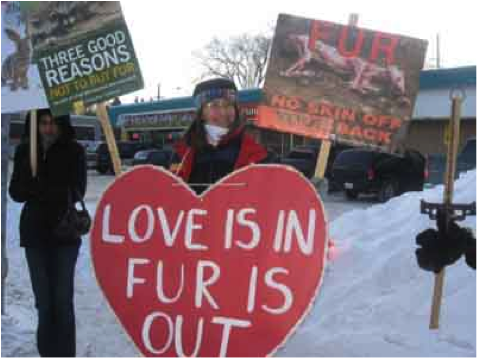 In the past wearing fur has been a taboo, fashion risk only attempted by the most fierce and courageous fashionistas. 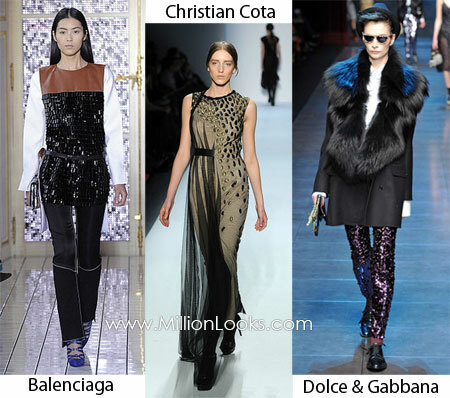 It takes a bold lady to rock a head-to-toe fur coat or accessorize with some cold-weather, furry accessories. However, recent trends have forecasted greater acceptance of this cozy fashion, so if you want to try it out without ending up in the middle of some harsh protest, as pictured in the images below, then take note of the following fuzzy tips. It all started with the introduction of the fur vest. Although this item was originally hard to find, it is now readily available and manufactured in an array of colors and fur types. Pair this piece with a pair of jeans and a flowy top underneath. This ensemble can be dressed down for a day out shopping, or dressed up for a night out on the town with the girls. If you are not edgy enough to show off all that fur, then try a piece of clothing with just a tad bit of fur trimming. This sweater pictured below from the Urban Outfitters website is the perfect selection for the fur-phobic girl to get her faux fix. Maybe once you are comfortable with this outfit you can move on to bigger and better fur things. 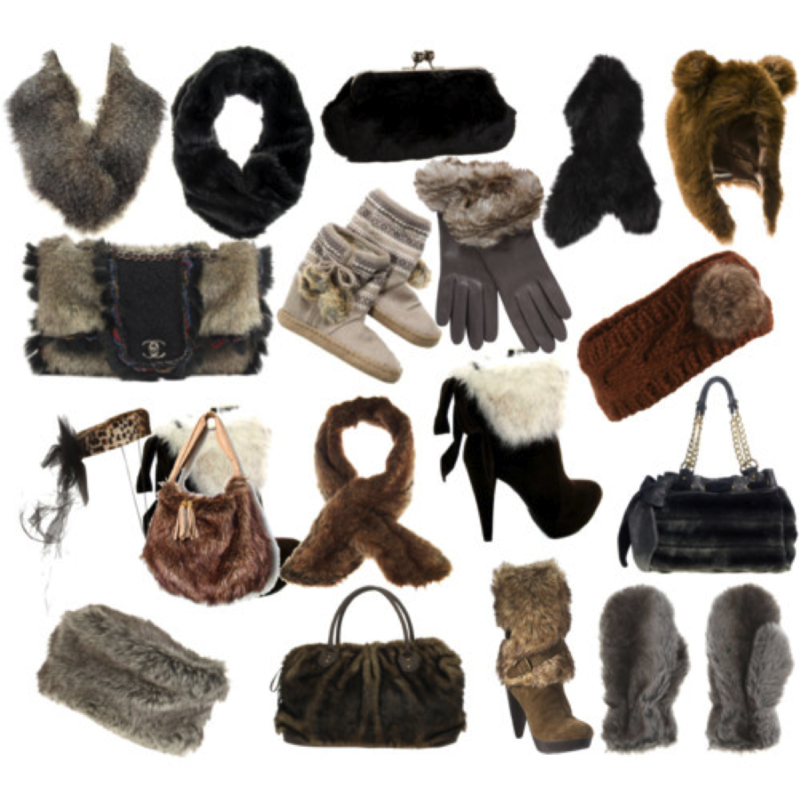 Also, if you are just looking for that final touch to pull an outfit together than you can choose from any of the accessories adorned with fur below. All of these would add the perfect dosage of fur to any get-up, whether it be jeans and a casual top or a fun, new party dress. 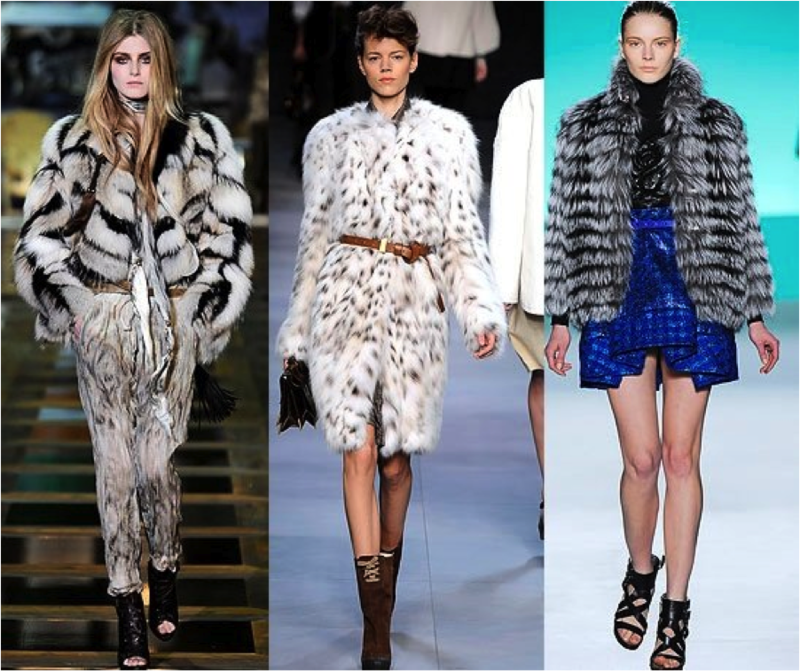 Finally, if you are fully prepared to go all out with this up and coming trend then look to the following images below from the runway for your fur inspiration. A great fur jacket would be a great addition to any wardrobe. Now that you have more than enough information about how to dress in the latest furs, get out there and flaunt it. Boots are a must have winter accessory! They can be expensive though, so you want to make sure you wear them right, and invest in a pair that goes with your closet. Personally I suggest purchasing two pairs, one black, and the other brown/ chestnut. That way you have a pair of boots that go with practically every outfit in your closet. But there is no point in buying a pair of boots if you can’t wear them right, and it seems extremely easy for some people to wear them wrong! One of our greatest pet peeves is when girls decide to wear Uggs with shorts. We see this on campus, sadly, all the time. I’m sorry, but if its warm enough to wear shorts, than its obviously too hot to wear Uggs! Not to mention, you look like RIDICULOUS! 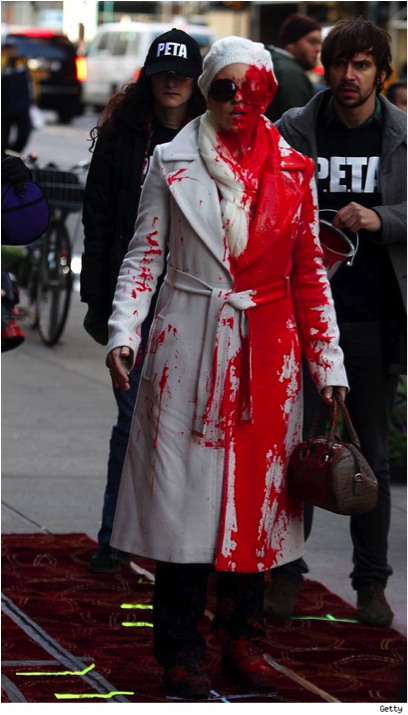 Sorry Britney, we love you, but you are the worst offender of this crime (pictures above). Please stop immediately!! You can wear boots, like cowboy boots, with shorts and skirts. That is acceptable, like the picture below. A helpful hint when wearing boots, is to wear them with skinny jeans, jeggings, or leggings. You don’t want look like you had to shove your boots on to fit over your jeans, and have a big bunched up denim mess by your knees. Here are some good examples of fashionable boots, and the right way to wear them. I hope these helpful hints and pictures, help you survive during the upcoming cold winter, and stay fashionable at the same time. Let the Boot Shopping Begin!! As the weather gets colder it is time to whip out those sweaters and scarves. Take advantage of the colder weather to bring out the best of fall! One of our favorite trends to keep you warm is chunky knits. 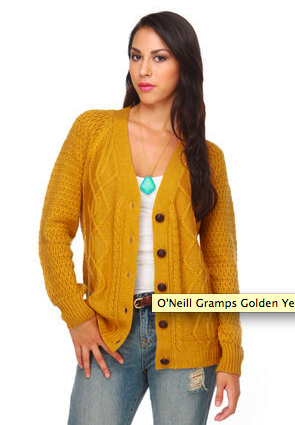 Knits are everywhere and also easily accessible to every shopper out there. 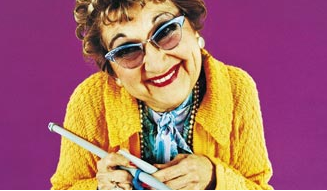 But fair warning, if you aren’t mindful of how to wear the trend, you will end up looking like a grandma. Our first tip for your sweaters is to keep it simple. Stay away from elaborate patterns and embellishments. But you can funk it up with the kind of knit, the chunkier the better. The next problem arises when it comes to matching the knits with the rest of your attire. If you want to be edgy pair your knits with a fun flowery skirt or shorts and tights. Or, you can keep the look simple with a basic shift dress and wedges. But the easiest way to wear the trend is to pair it with leggings or skinny jeans with your favorite pair of fall boots to complete the look and make it winter weather ready. Stick to slim and form fitting bottoms to balance out your sweater. The easiest way to have fun with the trend in the cold weather is with your neck wear. Of course scarves are always a necessity in November and December, so have fun with it! 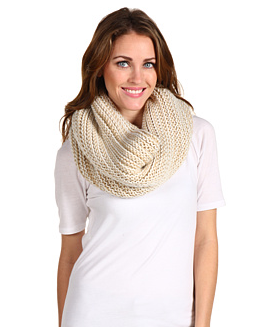 Chunky knits are a must for scarves. Stick to long lengths that you can layer and wrap around. 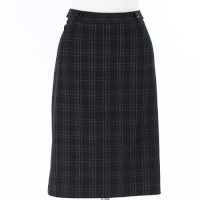 Over the years the trend in skirt length has changed drastically. It seems that the mini-skirt has never gone out of style, and now even the maxi length skirt has made a comeback through bohemian chic style. But if you’re looking for that trend that falls somewhere between those two lengths then never fear, the midi length is here. Although you may think that a skirt that hits just below the knee may have you dressed for tea time with grandma, pair this look with the right accessories, and you’ll be ready and trendy for all your fun, fall-time activities. So, throw out your original idea of a longer skirt that leaves you looking dull and ultra-conservative like the image pictured below. Choose a midi length skirt that is either fit to your body or one that is more fluid, and pair it with other fun, fall trends such as a turtleneck, over-the-knee boots, or a long chain necklace. The look below incorporates fall, neutral colors and is topped off with a pair of great, chunky heels. If you are looking for an outfit with a more casual interpretation of the trend look to the image pictured below. Dress down the skirt with a leather jacket and a pair of bold colored tights. This look is great for any on-the-go, daytime activities. This trend can be worn in many different ways, so don’t be afraid to have a little fun. Pictured below are two more examples of the trend put together and worn on the streets. Try it out, and see what fun, new looks you can come up with while taking advantage of this fresh and innovative trend. Another big trend this fall is flare jeans. A favorite quote of my boy friend is, “Go big, or go home”. While that may not be true for a lot of things that he’s talking about, it is true for flare jeans. A stylist to the stars, Laura Schauffmann, came and talked to us, and said that her favorite fall trend was flare jeans. But she said that you wear either really skinny jeans, or very flared jeans. No in betweens! 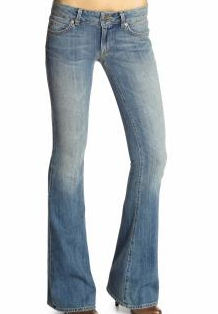 Flare jeans that we are used to buying look like this picture below. You can’t be scared to walk outside in the oversized flare trend. 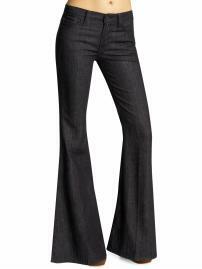 You need to be able to go over board and be confident when your wearing these flare jeans below. Courtesy of Piperlime.com 7 for All Mankind "The Rachel Bellbottom"
Above is the perfect example of the kind of flare jeans you should purchase for the fall. The jeans should flare out wide and just about cover your shoes. I also would suggest pairing these jeans with a nice pair of high heal shoes. A lot of stars are wearing this trend this fall, and very well. The best examples are Victoria Beckham, and Rachel Zoe, as shown below. Dont be scared to wear this trend. 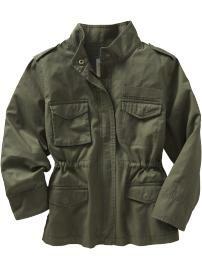 Its perfect for any figure, and no matter how tall you are you can wear it. I encourage every girl to run out and buy a pair of flare jeans immediately. GO!